A multiday severe weather outbreak continues to hammer the Midwest and Plains States, and the National Weather Service is warning that the Oklahoma City area, which was devastated by the Moore tornado earlier this month, may see more significant tornadoes on Friday. The severe thunderstorms are likely to form along a frontal zone that is draped from the Midwest down to the Plains, with a disturbance at the upper levels of the atmosphere adding a necessary spark to the already unstable situation. 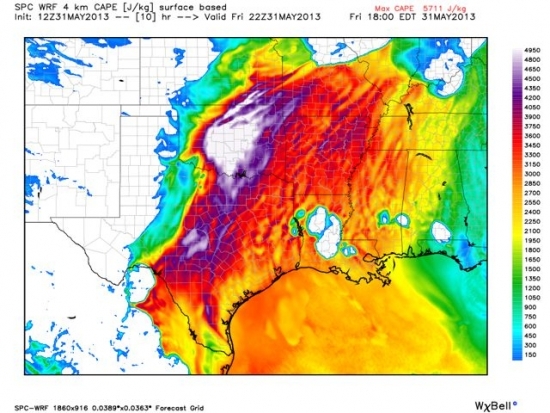 Computer projection showing the Convective Available Potential Energy (CAPE) on Friday afternoon, with a maximum centered in Oklahoma. CAPE is one measure of how unstable the atmosphere is. Temperatures have exceeded 100°F in parts of the Sooner State, and the Storm Prediction Center in Norman has issued a tornado watch with a “Particularly Dangerous Situation” designation, meaning that there is a likelihood of significant tornadoes in the watch area. That so-called “PDS watch” includes the Oklahoma City metro area and is in effect until midnight Friday, central time. Another tornado watch was in effect for eastern Kansas and much of central Missouri as of 4 p.m., with more to come as storms fire up toward early evening. 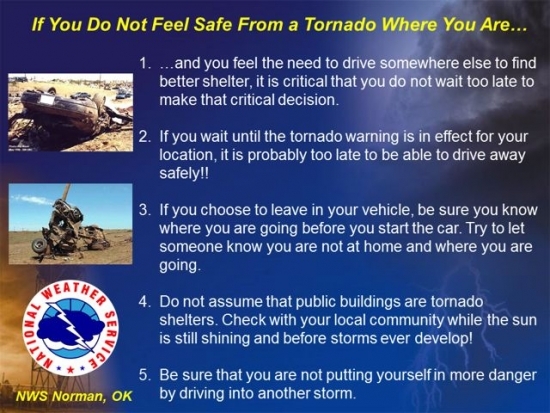 The NWS Office, which was widely praised for the advanced notice it provided to Moore residents during that EF-5 tornado event, issued a steady stream of specific tornado outlook and safety information via its social media accounts on Friday. For example, on its Twitter account, the NWS warned: “Times may change, but I would not want to be driving anywhere in the OKC metro after 4 p.m. today. Tornadoes not certain, but be ready!” The agency was also issuing similar statements from other offices in the affected areas, such as Tulsa and St. Louis. Tornado safety tips distributed by the NWS office in Norman, Oka. Click image to enlarge. Credit: NWS. In addition to the tornado threat in Oklahoma, Kansas, Missouri and other areas, severe thunderstorms are also expected to affect areas well to the north and northeast, including Minneapolis, Chicago, Milwaukee, Detroit, and Des Moines. Many of these areas have seen copious amounts of rainfall and severe storms in recent days, leading to flash flooding and rising rivers and streams. The heavy rain from this next round of storms will only further aggravate the situation, and flooding is likely in some areas through early next week.